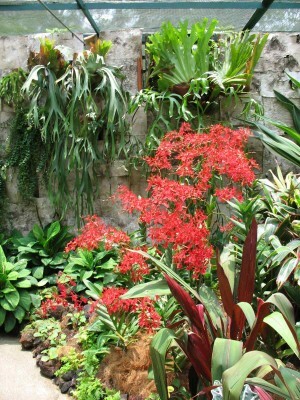 I have been on a long-haul trip and have some great botanic garden and other plant and design-related pictures to show you. My first stop was Singapore. 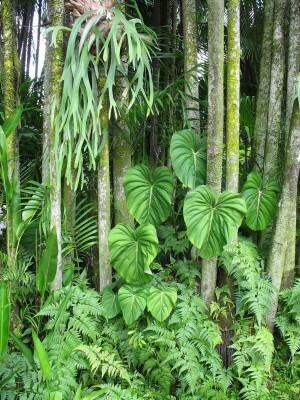 The botanic gardens there, as you would expect near the equator, with almost daily rainfall, are lush, green and full of tropical plants. 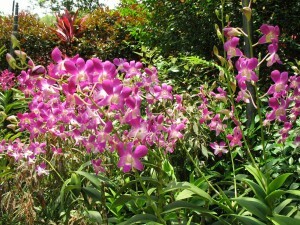 The star of the Gardens is the National Orchid Garden. 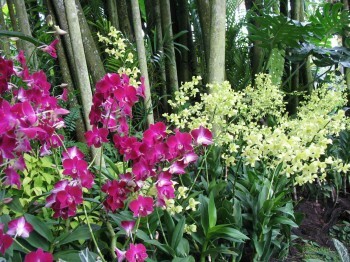 I just had time to visit the ‘Palm Valley’ and the Orchid Garden parts before my flight to Australia. which is fantastic to reach again when you have finished your tour, as it’s shady and the sound of the water is very soothing. 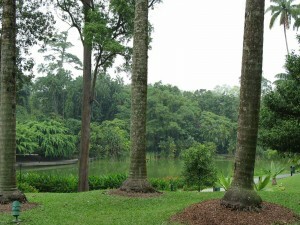 A path along an open valley from this area has many different sorts of palms growing scattered over the grass down to a lake where there are concert performances. 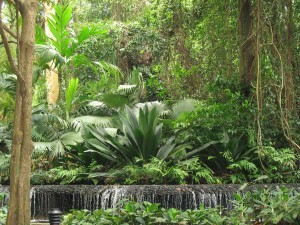 To one side is a little boardwalk among dense rainforest showing how Singapore was originally before the traders arrived. 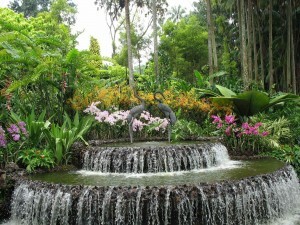 At the orchid garden is another waterfall display, this time with of course orchids. 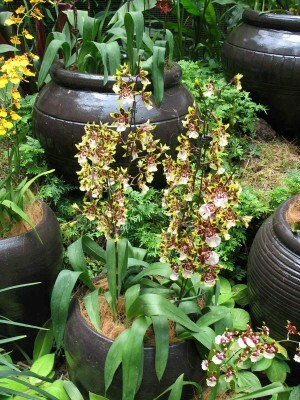 There are photo stops along the way where you can pose in front of the wonderful flowers. 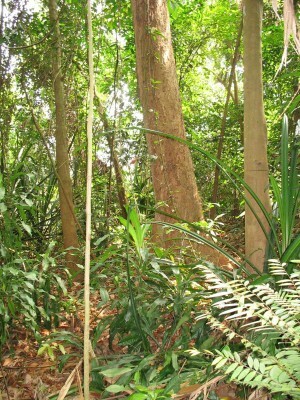 I also admired the stag’s horn ferns hanging from the trees, and other beautiful foliage. 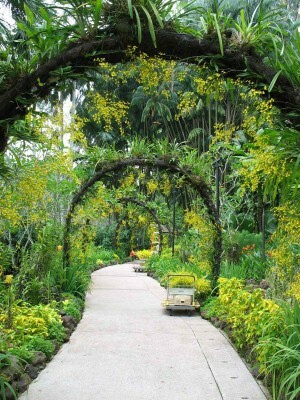 The keepers were just making these arches of little yellow orchids. 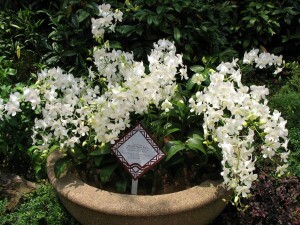 Here is one of their ‘celebrity orchids’: ‘Princess Diana’. 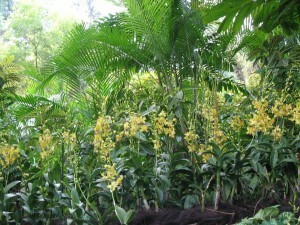 Some of the rarer orchids are kept in a greenhouse; here are some examples. Lastly – the lizard. 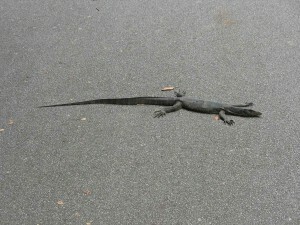 This was actually at least two feet long! 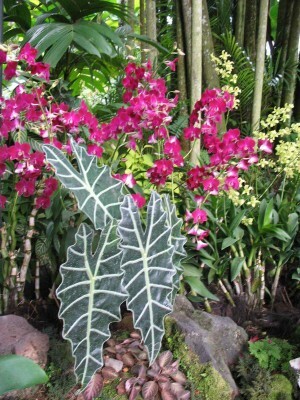 This visit has inspired me to use exotic-looking plants – in fact, as it happened, my next project was to design planting that was ‘lush, dense and green’ so I enjoyed thinking of my trip to the tropics while I was doing it. The plan can be seen here.